Just as things were heating up with President Trump saying he was probably going to have to declassify the reports in order to get the truth to the public, here comes this hurricane. We also have the hearing with getting Judge K approved, and now they claim there is a letter they need to have the FBI investigate. One stall tactic after another with these swamp rats. Now don't tell me the Deep State isn't behind this hurricane; the numbers are all Mason/Illuminati related. Notice the 666 number at the top, and then the threes in the body. Masons have something about the number 3. Anyone know what it is? Some of the You Tubers were really piling on the fear factor telling about this storm possibly making it to a cat 6 before making landfall, but last I heard it was a cat 2, so that's one good thing. My thoughts and well wishes go out to all affected by this storm. We need to keep an eye on the others out in the ocean too. Remember last year when it was one after another threatening the U.S.? It appears it could be a repeat this year. Wasn't it the Washington Post that blamed the hurricane on Trump?! I wish they'd make their minds up! Quote: Hurricane Florence: Washington Post declares Trump is 'complicit' for dangerous storm. Hurricane Florence because of his views on climate change. launched an attack on the president. systems to produce disasters,” the editorial board wrote. themselves and further erode Americans confidence in them” on a daily basis. Barron said. “The media won’t give Trump credit for the economy but they will blame him for a hurricane. was 530 miles south east of Cape Fear, North Carolina and moving west northwest at 17 mph. surge upwards of six feet in parts of the coastline, including up to 13 feet from Cape Fear north to Cape Lookout. folks in the media will try to exploit it to attack the president,” Mediaite columnist Joseph Wulfsohn told Fox News. Florence is “bigger than anticipated.” “Hurricane Florence is looking bigger than anticipated,” Trump tweeted. Sept. 11, 2001, attacks, which killed nearly 3,000 people. (09-13-2018, 10:00 PM)BIAD Wrote: Wasn't it the Washington Post that blamed the hurricane on Trump?! Oh, give me a f***ing break! And as for attacking that man's... umm... Barry's plan, I say "Well done, Sir; make him just a bad memory!" No such thing as a "cat6" hurricane - they top out at category 5. On a positive note, it looks like it's going to run right through here, and probably there, too. That much water ought to refill the wells and make the springs spring! Update: Not much damage from wind, but the slow-moving system is causing some big problems with flooding. Quote: • Some 200 people were rescued from flood-marooned homes overnight in New Bern, the mayor, Dana Outlaw, said. Another 150 were in need of rescue on Friday morning. • About 60 people were evacuated from a hotel in Jacksonville, N.C., local news media reported, after the storm’s strong winds threatened the structural integrity of the building. • The storm surge had reached seven feet on Emerald Isle, N.C., and could climb as high as 11 feet elsewhere. A high tide around noon Friday could exacerbate the surge. Rainfall of up to 40 inches is expected to bring widespread inland flooding. • More than 400,000 people have lost power in North Carolina, while officials in Onslow County [url=https://twitter.com/OnslowPIO/status/1040450268981284864]reported “major structural damage to homes, businesses and institutions” by midnight Friday. • Florence is proving to be a lumbering giant, crawling along the coastline as it dumps rain across the Carolinas. Anxiety is high in towns as far inland as Greenville, N.C., where residents braced for the one-two punch of rain and storm surge. Read more about the expected floods here. • More than 4,500 people had checked into shelters in South Carolina, and the authorities said they had space for more than 34,000 across 64 shelters. North Carolina had opened 126 shelters for about 12,000 people, and is trying to open more. At least 7 dead as flood waters continue to rise. North Carolina Gov. Roy Cooper warned residents to remain vigilant and aware as some of the most detrimental impacts of Florence, which is now a tropical storm, are yet to come. "We just don't want people to think this thing is over because it's not," Cooper said Saturday of Florence, which made landfall near Wrightsville Beach on Friday morning. "We're going to see areas of flooding that have not flooded before," he said, adding "I have a real concern about that." Heavy rain is expected to continue in North and South Carolina through the weekend and over the next few days. That will bring additional water to the already-soaked states as well as additional threats like possible landslides in the more mountainous inland parts and electrocution threats with downed power lines. Cooper said the storm, which is slow-moving and hovering over the Carolinas, "will eventually leave our state," but he called on residents to be resilient until then. "This one is sure testing us, but now is the time for us to persevere. I have never known North Carolinians to quit in the face of a challenge, and we're not about to start," Cooper said. The rain and flooding expected Saturday could double the 10 to 20 inches that have fallen so far. Neighboring South Carolina was bracing overnight for the brutal wallop of widespread flash flooding, mad, whipping wind and relentless rainfall that crept across the border into the eastern half of the state before dawn. Florence, which weakened from a Category 1 hurricane when it made landfall early Friday morning to a tropical storm, is expected by Saturday evening to be downgraded to a tropical depression -- but the torrential rain shows no signs of letting up anytime soon. 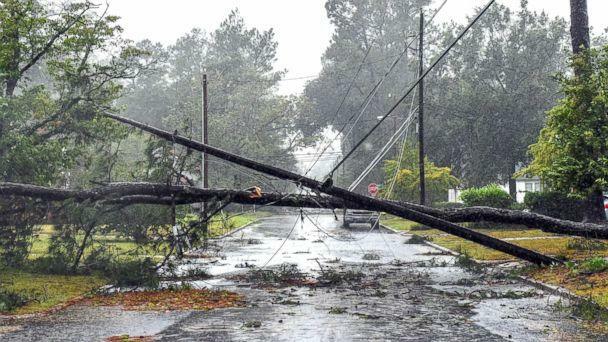 There are still more than 990,000 people without power in North and South Carolina combined early Saturday. Jeff Byard, the FEMA associate administrator for response and recovery, warned Saturday that the danger is not over. "There is a lot of rain to come. There's a lot of rain that's following," Byard said at a news conference Saturday morning. "A lot of rain's going to fall. It's gotta go somewhere, and we want to be prepared to respond as quickly as possible," he said. NOAA representative Steve Goldstein said the storm will produce “catastrophic flooding” for North Carolina and South Carolina in the coming days. The White House announced Saturday that President Donald Trump approved a disaster declaration for North Carolina, which makes federal funding available for temporary housing and home repairs among other forms of assistance. Struggling with wind...? Well, only some! (09-15-2018, 06:35 PM)BIAD Wrote: Struggling with wind...? Well, only some! Yes, I have already seen a couple of people making mocking videos on Face Book. Click on the pic below.